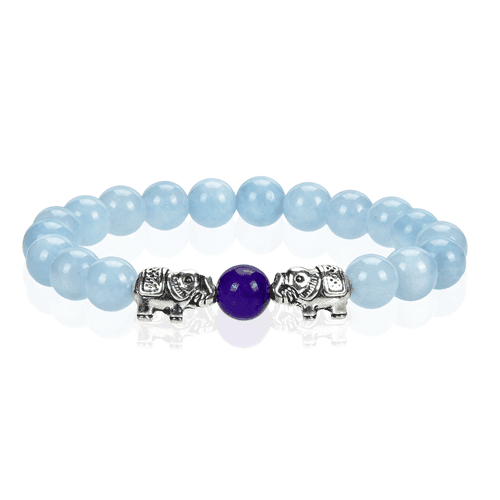 Double Alloy Elephants Crystal Blue Beaded Bracelet Design Double Alloy Elephants Crystal Blue Beaded Bracelet 20 MM wide polyester lanyard allows a wide space for your logo to be printed, These lanyards are idea for your large complex logo. It comes with free metal Bulldog clip with Badge Holder attached. 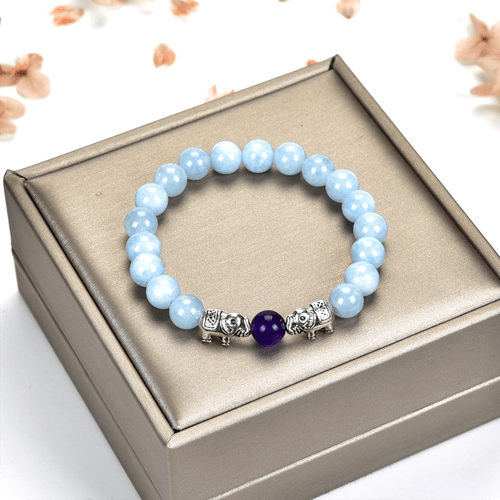 All Aquamarine beads and the purple beads are 8mm diameter, Stringed with good quality and durable elastic cord. Description: Aquamarine beads processes a gentle and charming energy that encourages compassion and tolerance. And Aquamarine is believed that a person wearing it can be protected from seasickness, and its soothing vibrations aid in banishing fear and anger.